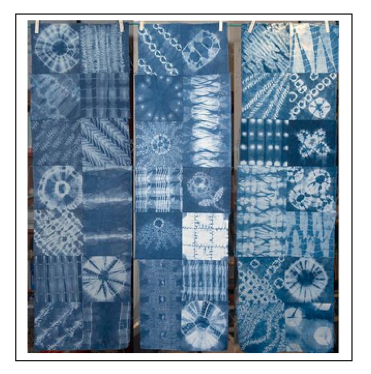 Examples of Traditional Indigo Dyeing Technique including Japanese resist, Shibori. All 6th grade students will have three sessions with the visiting artists (see schedule for details). The first will be a buddy session with K students. The second & third sessions will be dedicating to ancient dying techniques, aesthetic decisions for completing the three triptych panels, and the creation of “I am a Peacemaker” scrolls for the school. Additional open sessions may be scheduled during recess and/or after school times for highly motivated students. Artist will meet with the 6th students for the first half hour where they will assist in material prep, thendiscuss mentoring activities for K students. K students arrive at 9am; Artist will read One written by Kathryn Otoshi. Artist and students (including sixth grade buddies) will discuss & explore guiding questions aboutfeelings, bullying, standing up for others, etc. as a group. 6th graders will pair with K buddies to brainstorm and develop a draft page of responses to questions.Goal: 2-3 “messages of kindness & peace” for each buddy pair. 6th graders assist kindergartners in writing messages on prepared strips of fabric; pencil > perm. marker. As time allows, K & 6th students may work in larger groups of buddy sets and select from thesupplemental books provided; read then discuss these “messages of kindness & peace” in the books. The artist will introduce ancient dying process with authentic indigo dyes. The artist will demonstrate fabric folding and binding techniques. Students will explore various binding techniques for different fabric outcomes. Other students will tie finished fabric to the bamboo frame and collaborate on final aesthetic decisions. 6th graders will lead the school by creating “I am a Peacemaker” scrolls. Small groups of students mayvisit classrooms to elicit signatures of all students in the school. These signed hanging scrolls will bedisplayed along side the finished triptych. Other students will work in stations to dye additional fabric and bind fabric to complete frame. Students may benefit from exploring the guiding concepts listed each week of the residency schedule, and through other classroom activities related to bullying and peacemaking. See the book list on our google doc and books selection in the MLS library. Sixth grade teachers will receive the names of the three chosen hero/peacemakers (mid Feb.) and 6th students may wish to pursue independent research on these historic figures. Sixth grade teachers might also want to check out the PBS streaming videos from our google doc. Some short cyberbully videos can also be found at http://www.netsafeutah.org/parents/parent_videos.html.